It has been a suspenseful few weeks waiting for the grand announcement about Transform Onehunga and it finally arrived yesterday with somewhat little fanfare (come on Panuku and Councillor Darby – raising a glass of Grape Juice at the Wharf would have been a good photo 😉 ). The vision for the wharf is that it will be transformed in to a new community with homes, cafes, retail and public space, while retaining its seafaring history and spirit. The transformation will be led by the city’s redevelopment agency, Panuku Development Auckland, which will work with the community to realise the vision. The wharf was purchased by council from Ports of Auckland. Public events or development on the site are up to five years away, as there is a lot of behind-the-scenes work to do. This includes negotiating usage with other key players such as NZTA, undertaking maintenance and upgrades and working with existing leaseholders. The wharf also has health and safety issues which need to be addressed. “With the threat of the East-West Link severing the town from the waterfront removed, Onehunga Wharf can plan for a future as a magnet for Aucklanders, with the flavour of a new Wynyard Quarter. People can relax and socialise, or enjoy commercial, cultural and tourism activity – all right alongside the existing fishing industry. The redevelopment of Onehunga will be implemented over the next 25 years. It will include creating high-quality public spaces, mixed styles of housing close to the town centre, facilitating improved public transport and better connections to the Manukau Harbour. Maungakiekie-Tāmaki Councillor Josephine Bartley says securing the wharf is a key win for Onehunga. “The wharf plays a crucial role in connecting our community to the Manukau Harbour. It’s great to see it secured as an area that could eventually be opened up to the people of Onehunga as a flourishing and lively centre that is well-connected to its past, its community and the surrounding environment. “This landmark purchase is a critical component of the transformation of Onehunga. The wharf is the only west coast port in Auckland and has a rich and vibrant history dating back to pre-colonial times. “Wynyard Quarter was a place where we successfully transformed the waterfront in to a people-oriented place that is fully accessible to the public. We see similar potential in Onehunga,” says Marler. Panuku Development Auckland is a Council-controlled organisation established to deliver redevelopment in Auckland. We work across multiple locations and scales – from large long-term urban redevelopment projects, to small projects on specific sites – to meet the needs of the city’s long-term growth, including the requirement for more affordable homes. To find out more please visit www.panuku.co.nz, and sign up to the newsletter for regular updates. It is good to see the first major step (apart from the High Level Project Plan) underway for Transform Onehunga. Yes it will be about five years to see the first public project get off the ground but until September 2017 Transform Onehunga was threatened in going nowhere thanks to the then National Government’s recklessness with the East West Link. 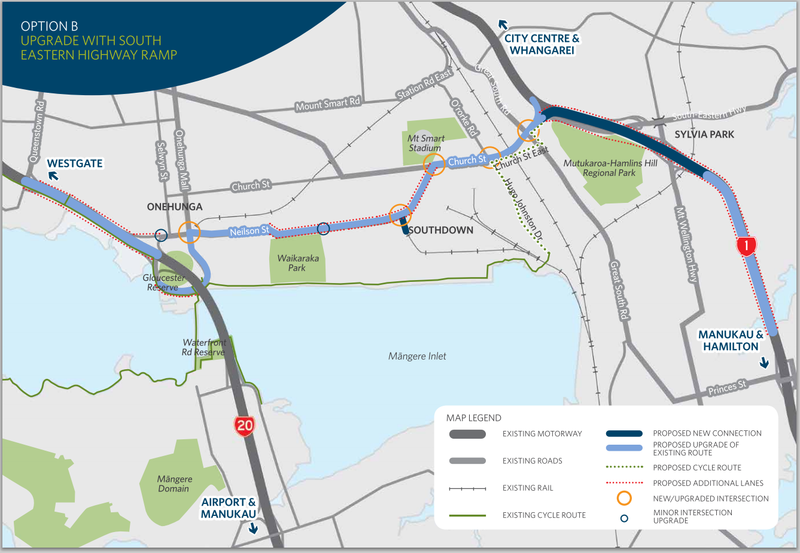 The then Option F for East West Link would have severed the wharf and the foreshore from Onehunga making the area a dead space – all to serve a truck motorway that did not connect back into the Onehunga industrial complex. However, when Labour came to power in 2017 one of the first things the Transport Minister (Twyford) would do is to abandon the destructive Option F and review East West Link into a more viable and environmentally friendly option. That option is most likely to be Option B – the option that had the best marginal Benefit Cost Ratio of the six options (Option F had the worst) allowed for improved connections to Onehunga while not ripping up the foreshore nor cutting off Onehunga Wharf! With the City Centre to Mangere (Airport) Light Rail also set to be delivered inside Decade 1 getting to Onehunga can be done in a congestion free way as well. Excellent to see the news from Panuku, now waiting on NZTA to firm up East West Link Option B then we can get going with Transform Onehunga. Also welcome Transform Onehunga from everyone at Transform Manukau – good to see you finally here after three years waiting (not your fault)! Auckland Transport Setting Out to Improve Our Streets – With Speed Management – FINALLY!! !